There are few things more pleasing than stepping into a gallery to enjoy the work of a skillful artist craftsman. Welcome to our gallery of God’s handiwork. The universe is full of Dandy Designs. Dandy is a word which means "excellent" or "first rate." Design means to plan and carry out a project in an artistic or skillful way. Design demands a Designer. Dandy Designs are things which we believe could not happen by mere chance. It is our mission to step back and look at those artistic and skillful projects and admire the excellent work of the First-Rate Designer of the Universe. What Good is a Sponge? 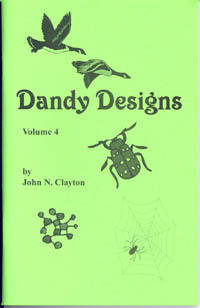 CLICK HERE to see the Dandy Designs books that are available. Copyright 2006-2015 PowerVine. All rights reserved.